Cupcakes are a must have, always! Well in my world they are and if you’re reading this, I assume you would agree. One of my favourite things to do is to create new and inventive cupcake flavours. The possibilities are endless when it comes to pairing different flavours together. 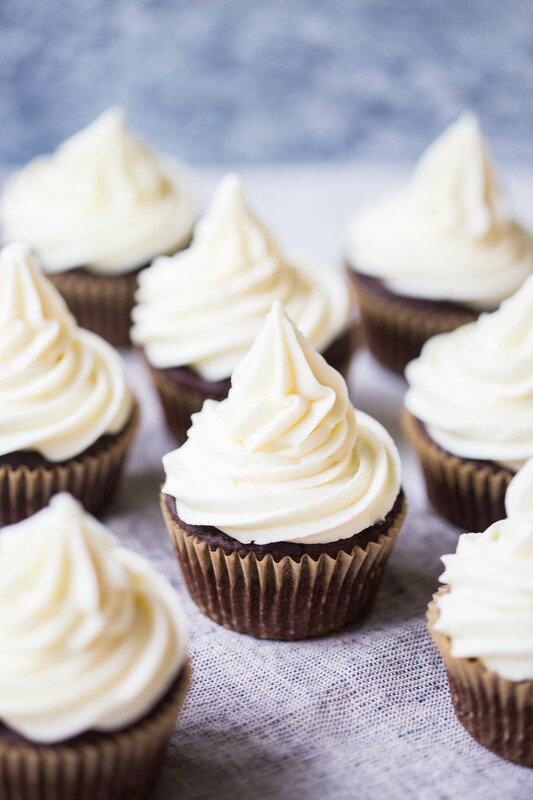 Now these beautiful cupcakes are just one of many to come here on Wholesome Patisserie, because as you know, cupcakes are my most favourite baked good! I decided to take three delicious sweet flavours and incorporate them into one unbelievably delightful cupcake, a powerhouse of flavour! 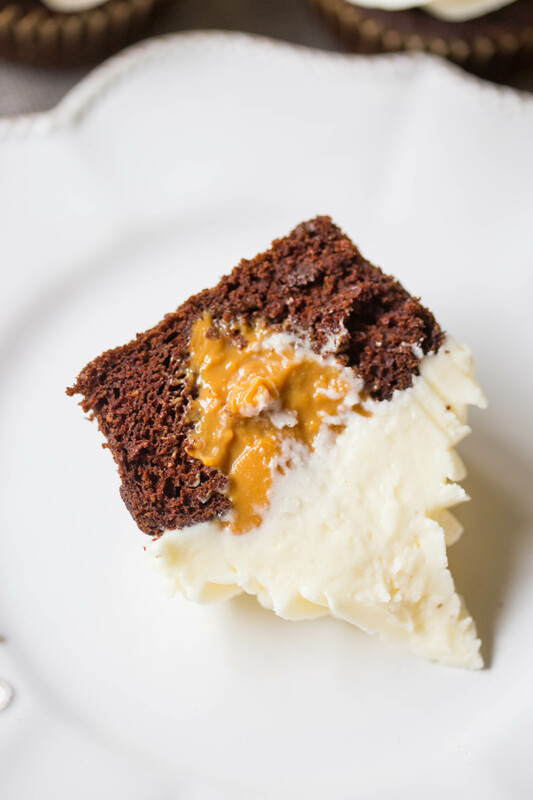 My classic gluten free chocolate cake recipe, caramel filling and white chocolate buttercream frosting, you’re welcome. I was looking through my cupcake collection the other day here on my blog and I noticed that I don’t have as many cupcake recipes that I should have by now. Obviously it’s time for me to create a brand new gluten free cupcake recipe for you. I took three perfect flavours and I knew that no doubt they would compliment each other in one cupcake. As I have mentioned before, this gluten free chocolate cake recipe is my go-to one. If there is something I love to do, it is to prove people wrong when they say gluten free chocolate cake doesn’t taste the same as regular chocolate cake made with wheat flour. This cake recipe is the exact one that you will use prove them wrong. I have made various other chocolate gluten free cakes and nothing compares to this one in terms of flavour, texture, ingredients and how it bakes. The ingredients are easily accessible and most of them you would already have in your own pantry! Use my gluten free all purpose flour for this recipe. 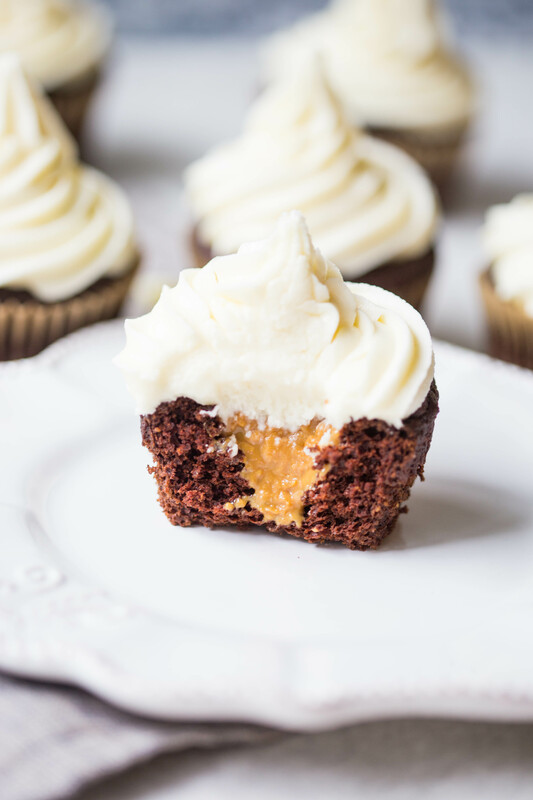 Let’s get down to business and dive into the deliciousness of these heavenly and morish cupcakes. Now we already talked about the chocolate cake and how it is the most awesome gluten free cake recipe, so let’s move onto the center. Of course I added a filling to these beauties, caramel! You can make your own caramel filling and I could’ve also, but let’s be real here, sometimes we ain’t got no time for that! Pre-made caramel in a can to the rescue, how delightful and nourishing does that sound… I have my guilty pleasures too 😉 Sometimes you will see be making caramel from scratch and other times you will see me spooning unhealthy caramel from a can. 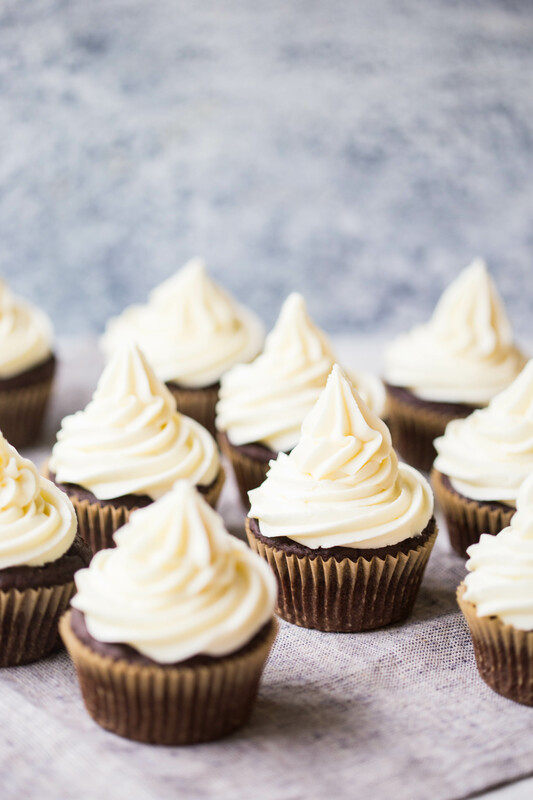 Moving on, frosting is the ever so magical buttercream topping which has been infused with melted white chocolate, *eyes roll back and drools*. Can we please just take a moment to appreciate caramel and white chocolate together..? Milk and dark chocolate are clearly front runners in the combination of caramel and chocolate but I’m slowly discovering that white chocolate and caramel are awesome on a whole new level. I’m getting excited at the possibilities of recipes combing these two flavours, watch this space! Enjoy your cupcakes, i know you will. Bake for 18-20 minutes or until a toothpick inserted into the middle comes out clean. Between additions of icing sugar, add milk, 1 tablespoon at a time. Add melted white chocolate and beat mixture for a further 1-2 minutes or until light and fluffy. 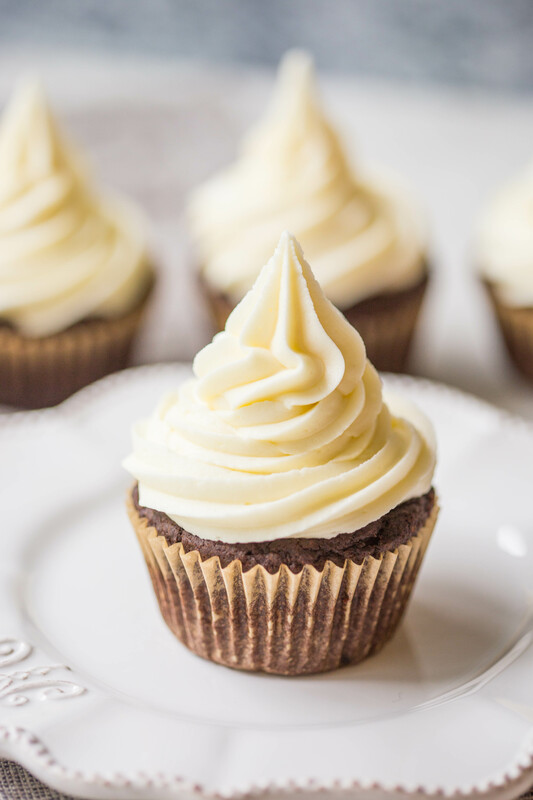 When cupcakes have completely cooled, take a small sharp knife and cut a V-shaped piece out of the top of each cupcake, about 1" deep x 1" wide. Spoon caramel into holes, until filled in.